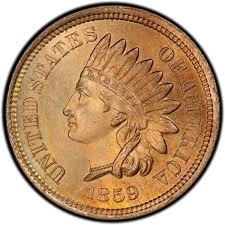 The 1880 Indian Head Penny had a mintage of 38,964,955. These 1880 Indian Head Pennies are generally available in grades from Almost Good to Extra Fine. We use strict Photograde standards when grading all of our coins. You can view the "general guidelines" as to what condition you can expect for each grade on the main page for Indian Head Pennies. Please allow 3 to 5 business days for your order to leave our offices as each coin must be inspected and graded prior to packaging. All items were received in the conditions requested and were, as a group, an excellent value. I was skeptical about ordering on-line without actually seeing the merchandise, but now expect to be a repeat customer.